In this first book that I've read by Davalynn, I found myself “thrown off” the train in the middle of the night just as Elizabeth Beaumont–aka Betsy Parker—was and plunked in the middle of fighting a fire and a town I never thought I'd be back to. Yep, it was that real from the first line! My only regret, I never read 'An Improper Proposal' first so therefore I didn't have the backstory to exactly who Elizabeth was and why she never thought she'd return to her hometown. It took me a couple of chapters or so to really get into it and feel like I wasn't missing something important. Well worth my time reading it however, because I fell in love with the characters and Olin Springs, Colorado! Sheriff Garret Wilson seems to get a kick out of goading Elizabeth every chance he got, finding new ways of stoking the fire of her anger just to see sparks fly. He irritated me on more than one occasion! But as I read further, he somehow wiggled his way in my heart...obstinate man! He's just as tight-lipped as Elizabeth is about his past and where he came from. Trying to get information out of these two was like pulling a nail out of a solid wood plank—pardon the cliché! However, Davalynn slowly coaxed it out of them with her persistent and gentle writing; kind of like gentling a skittish filly. Both of them need to face the past head-on with the grace and forgiveness that God extends to each of us and rid themselves of self-inflicted guilt. There's also the backdrop of a mysterious arsonist to catch and a suspicious character to figure out. A great read and time well spent in the pages of this book. Plenty of reminders of our own struggles with regret and guilt and where we can take those; to the cross Christ provided for us! I also enjoyed getting to know each of the characters. I think Maggie has to stand out to me with her wisdom and taking Elizabeth (Betsy) under her wing showing her the unconditional love of a friend and the Lord. 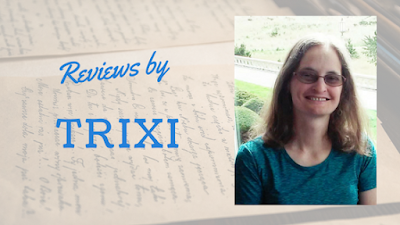 Yep, this is one book I'd recommend to anyone who loves western historicals sprinkled with faith, love and forgiveness! An Unexpected Redemption - Book 2 in the Front Range Brides collection of stories about strong women who find and defend love in 1880s Colorado. He doesn’t need her sass. She doesn’t need his approval. But they both need a second chance. 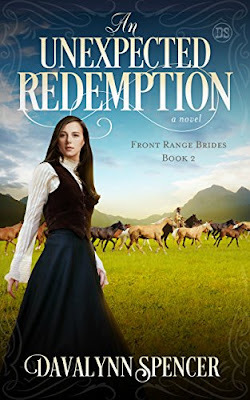 Abandoned by her faithless husband for the Dakota gold fields, rancher's daughter Elizabeth Beaumont returns to her hometown determined to prove she’s not the impetuous girl she once was. Armed with a new skill and old determination, she’s intent on making it on her own. Discovering that the new sheriff lives downstairs in the same boarding house wouldn’t be nearly so frustrating if he’d stay out of her affairs, quit calling her Betsy, and stop making her wonder if she could love again. Sheriff Garrett Wilson’s first attempt at law enforcement cost an innocent bystander his life, so he exchanged his deputy’s badge for a drover’s bedroll. Now he’s back wearing a star in a Front Range cow town, hunting an arsonist and falling for a woman who wants to know the secret behind his deepest scar. He can run again from his painful past, or he can stay and fight for the town that needs him and the woman who’s worked under his skin and into his heart. I'm glad you pointed out the fact this is the second in a series. It will give readers the nod to grab TWO books by Davalynn!